I am eagerly awaiting the John Carter movie coming out next month. I read the first three novels last year and liked them a lot; the first novel in particular was quite amazing for having been written in 1911. I read the Marvel Comics adaptions in the 1970s and liked those, too. 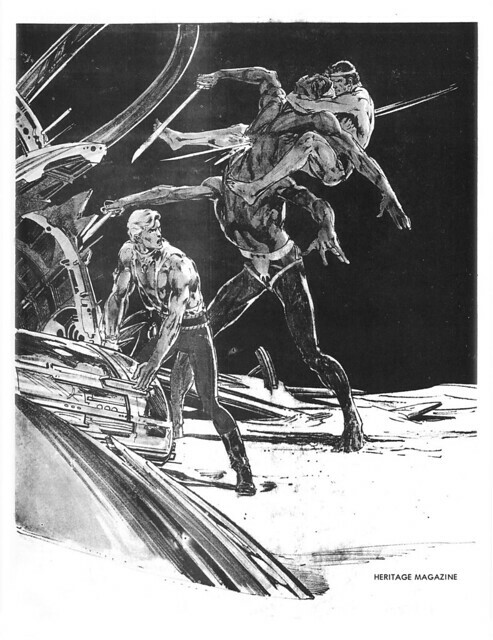 I always wondered what an artist like Neal Adams would do with the John Carter material. There following illustrations give us all a clue as to what that would have been like. These illustrations come from Heritage Magazine from the 1970s. Was this a preview of a longer story planned for a future issue? Or a graphic album for a publisher? Not sure at all! But the first illustration shows the crash of a spacecraft on Mars. I read that this fellow is Flash Gordon--didn't get that right away but it makes sense. 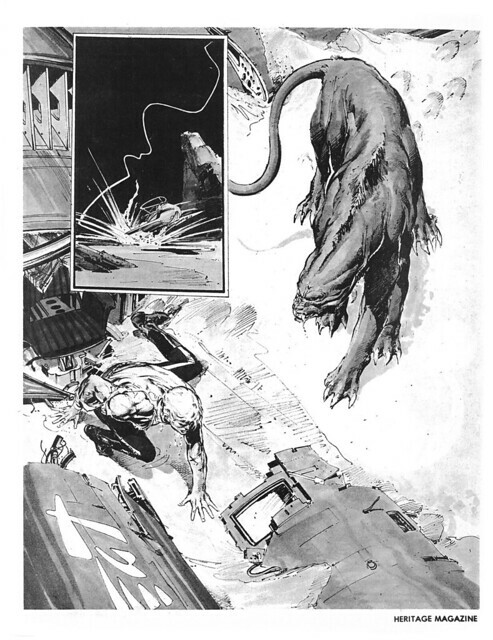 Second illustration shows Flash getting saved from a sneaky Red Martian. His savior is none other than John Carter of Mars! But wait, what is in that container that Flash is standing over? It turns out the none other than Tarzan of the Apes is somewhat comatose inside that container! What an awesome team-up adventure this would have been, if Neal Adams had drawn that at the height of his artistic ability! 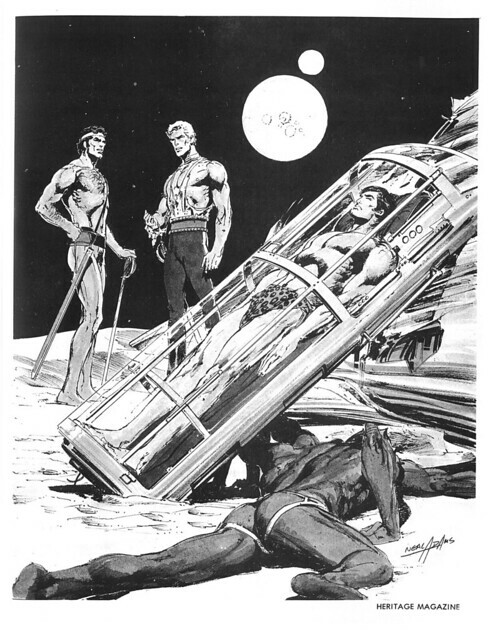 Questions: do any super-fans out there know why Neal Adams had created these illustrations and what his ultimate plan was? Have John Carter of Mars and Tarzan ever met in any work of fiction? (I know that Philip Jose Farmer had his Tarzan and Doc Savage analogs meet in A Feast Unknown.) Please let me know! Nuff Said. Outstanding stuff! I've never seen this material before. Thanks. Tarzan and John Carter teamed up in a Dark Horse limited but I'm not aware of any prose crossovers. Hey thanks--I see that was in 1996. Bruce Jones and Ricardo Villagran, have to find that one! MIght it have been for a Power Records release that went unreleased...I seem to recall Adams did a lot of artwork for those. Good guess and that could be the answer. A quick google search gave me this blog PowerRecord with lots of cool Adams art. I was going to scan my copy of Heritage 1B — but you saved me from bending the spine. Thank you! I've only seen these pages in my "Neal Adams Treasury", printed 1976 by Pure Imagination. It's always been my assumption that the blond gent was Carson Napier. With Tarzan and Carter, it just seemed an obvious choice of the Brotherhood of Burroughs' Heroes. In the "Carson of Venus" books, Napier was intending to go to Mars, but a navigational disaster sent him to Venus. In this flight of speculation by Adams, it seems he did in fact (barely) make it to Mars. How he happened to have the Lord of the Apes on ice is fuel for mad imaginations. Can you imagine Tarzan on Barsoom? He could practically do John Carter super stunts on EARTH. On Barsoom, he'd be a juggernaut.